At the age of 23, Kris Hallenga was diagnosed with terminal breast cancer. On average people given this diagnosis live for two-and-a-half years, but 10 years later she wants people to know that it is possible to beat the odds. A tightrope artist walks along the line created by Kris Hallenga’s mastectomy scar. “I got the tattoo maybe three years ago now, it’s to represent the balance of any illness with life and everything else,” she says. Kris has never tried to hide or deny her condition. Instead she has embraced it as part of her life. When diagnosed with advanced breast cancer in 2009, she decided not to get angry, but instead set up a charity called CoppaFeel, to raise awareness of the disease among young people and encourage them to check their breasts regularly. Even before her diagnosis, she had become aware how fragile life is. She was left shaken at 15 by the death of a grandmother. Then, five years later, her father died. 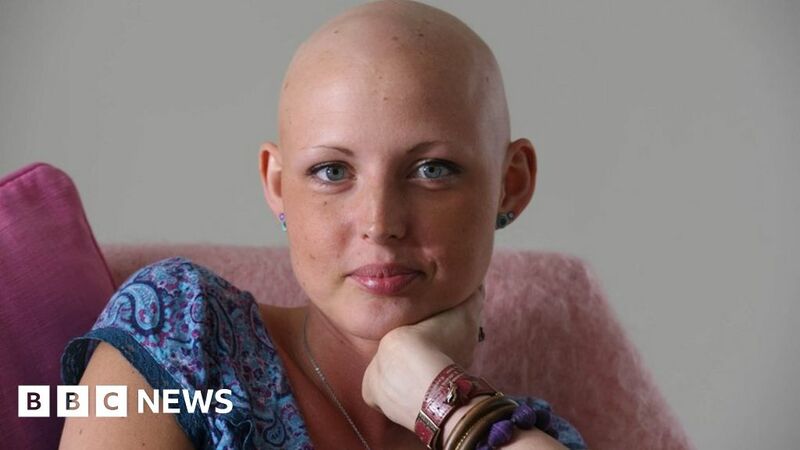 On the 19 February, 10 years will have elapsed since the moment she was told she had stage-four breast cancer. He says there are different degrees of stage-four breast cancer, but they are nearly always incurable. Kris’s cancer had already spread to her pelvis, liver and hips and she also had a tumour in her brain. She says no doctor has ever given her a personal prognosis, and she says she is glad about that, “because I think that would have really held me back, and I don’t believe in those timescales”. Her own doctor, Duncan Wheatley, says survival rates vary depending on the biology of the disease – some cancers can behave much worse than others even if they look the same. But there have also been scientific advances in the last 10 years, so quite a few of the drugs that Kris has been given were not around when she was first diagnosed. Breast cancer survival rates have been increasing over the last 40 years, according to Macmillan Cancer Support, thanks to improved treatments, increased awareness and faster diagnosis. In the 1970s, about five out of 10 women survived beyond five years after diagnosis, but now more than eight out of 10 do. The earlier the diagnosis the better the chances of survival. Nine out of 10 women live beyond five years with stage-one breast cancer, compared with one in 10 women who have been diagnosed with stage-four breast cancer. Patients like Kris who do much better than predicted are often referred to as “long-term survivors”. It’s written into the contracts of all CoppaFeel staff that they take the day off every 19 February and do something that reminds them why being alive is so great. This could be spending the day with family or going to see an exhibition they had been meaning to see. This year Kris is planning to have a party with friends and family. “I would like to look back over the last 10 years and have a good laugh about all the silly things that we got up to and all the milestones for the charity. I think that will be really fun,” she says. She has changed a lot as a person over the last 10 years, but one thing has always remained the same – her positivity. “I wasn’t a particularly confident person before I was diagnosed, so I wouldn’t recognise the person that I was the day before I was told I had cancer, she is very strange to me now,” says Kris, “but then it has been 10 years and I think you change a lot between 23 and 33, so that’s probably common for a lot of people. Kris says her determination to raise awareness among young women has been “one of the key factors as to why I’m still here”. She feels the real results of her work will not be seen until the young women she is urging to check their breasts start to reach middle age. The chance of developing breast cancer before the age of 30 is about 0.05% or one in 2,000, which increases to one in 50 or 2% before the age of 50. One in three women diagnosed with breast cancer in the UK is aged over 70. Although she stepped down as CoppaFeel’s CEO a couple of years ago, she still works for the charity part-time. She also moved from London to Cornwall, where she lives with her cat, to be closer to her twin sister, Maren. “I do a walk on the beach once a day,” she says. “I just find it so much easier and better to be calm and grateful in this huge expanse and so I love being outside. I love spending time with friends. I love cooking, I love food, I love all the good stuff, nothing crazy, my hobbies aren’t mad. I just like being alive. But she also continues to sometimes do things that are out of the ordinary too. At the end of last year, for instance, she took part in a music video for the girl band, Little Mix. The song, called Strip, promoted female body confidence and brought together inspirational women. “I got to choose what I wore and I wanted my mastectomy tattoo to be visible,” Kris says. “I wanted that to be quite an obvious thing. I didn’t want to wear something with my prosthesis in. No-one told me that I had to make it obvious that I only had one breast, but for me it was important that we did, otherwise what was the point of me taking part in the video? Kris aspires to be like the tightrope walker in her tattoo, striking a steady balance between her life and her condition but doesn’t always succeed. “I’m not always completely balanced and able to control everything at all times, especially when the cancer has decided to be active again, then I get into quite a tailspin,” she says. Recently Kris discovered her cancer has progressed again and she describes herself as being in “limbo land” at the moment about what treatment she might need. “The other day I had some brain lesions zapped with special radiation therapy,” says Kris. “That stuff is amazing, I’ve had that quite a lot and so my brain is now back under control – my liver isn’t – so we are trying to work out the next steps, but I don’t want to rush into anything. One Christmas Eve Karrie-Ann was told she had breast cancer. Still reeling from the news, a few weeks later she got another big shock – she was three months pregnant.